Two Spennymoor Town Band stalwarts have been rewarded for their efforts within the organisation by being honoured with Presidential roles. 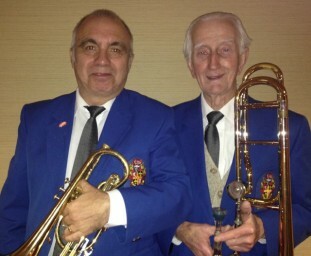 Bass trombonist George Lavery , who will be 90 years old in late January who becomes President, has been involved in the brass band movement, nearly all with Spennymoor, for 75 years. Vice President Hugh Stephenson, who through his fundraising efforts has secured the band’s financial security for over 30 years.